I have now been in a number of surgeries with Dr Kamal during my time at Green Pastures. 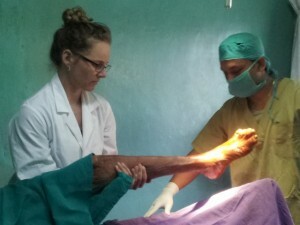 No fewer than 99% of patients were requiring debridement and amputation of toes or fingers as a consequence of leprosy patients’ nemesis – pressure ulcers. The last 1% were requiring biopsies to rule out a chronic ulcer from a squamous cell carcinoma, which was well on it’s was if that was the case. Before I launch in, I apologize in advance to those who are prone to becoming a wee bit squeamish as this blog does get a little gruesome. No fewer than 99% of patients were requiring debridement and amputation of toes or fingers as a consequence of leprosy patients' nemesis - pressure ulcers. Green Pastures has two surgical theaters, one for minor and one for major surgeries. The larger operating theatre is for big surgeries such as below knee amputations or foot-drop corrections for example. Orthopaedic surgeons and anesthetists from one of the main government hospitals currently come to perform these surgeries on an ‘as required’ basis. They previously operated every tuesday but haven’t operated here for over three months because of fewer patients. I really hope that this is the fruits of better treatment, education and earlier diagnosis starting to shine through. 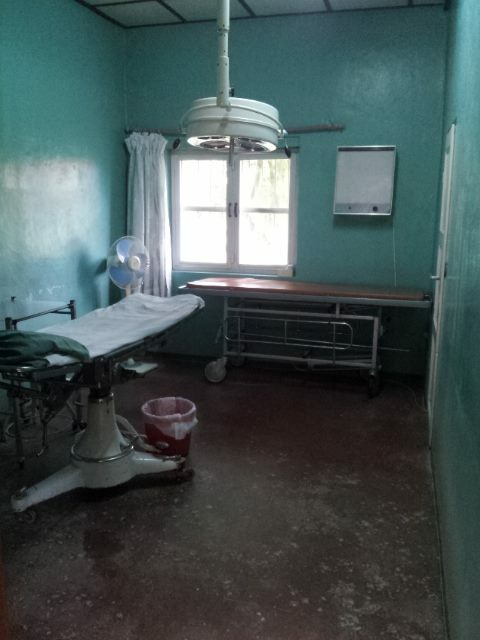 The every-day ‘minor’ surgeries such as wound debridements, digit amputations and ulcer excision occur in a smaller, simple, open aired room that is equipped with an operating table, an oxygen bottle, a light, x-ray board, a needle disposing bin and not much else. All minor surgeries are performed under local anesthetic with whole foot, toe or finger numbed with a ring block before the skin, tissue and infected bone are removed. Yip you read correctly…this is all done under local, the patient lying there quietly, a few brave ones watching as they lose a digit to the plastic rubbish bin below the table. Green Pastures has two surgical theaters, one for minor and one for major surgeries. Patients are wheeled in in their normal everyday clothing and draped with machine washed sheets. Instruments are to, washed and reused. I couldn’t confidently say sterilized, as I suspect they possibly aren’t in the true meaning of the word given instruments are unwrapped from newspaper. It seems worse thinking about it in retrospect than it does at the time as the whole thing proceeds in a very ordered and calm manner. The worst case was a badly infected foot ulcer under the 4th toe which had become so extensive once the pus was drained and dead tissue pulled away, a large 4-5cm wedge between the 3rd and 4th toe existed, all tendons and bone freely visible. The complete 4th metatarsal and distal 3rd metatarsal head were removed, the wound irrigated and packed with an iodine soaked swab. The ulcer on the underside was also excised and closed. 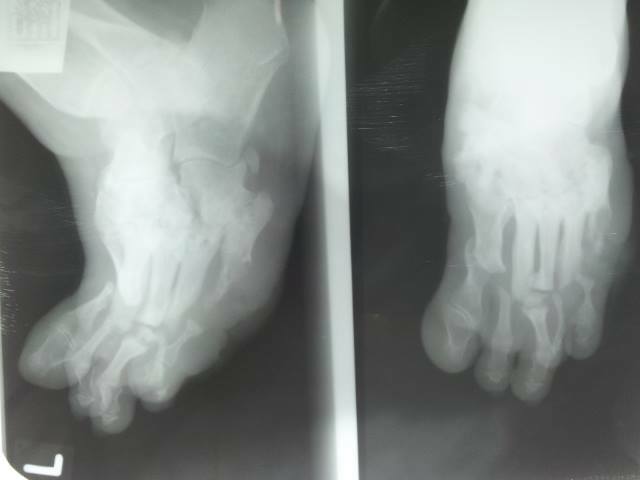 The patient whose x-ray is in this blog, belongs 50 year old women diagnosed with leprosy 9 years ago with an initial presentation of anesthesia of her feet. This x-ray doesn’t need describing really, you can see the huge amount of trauma due to not being able to feel anything. She is still walking despite all these breaks. Looking back through her notes this patient has been admitted at least once or twice annually for ulcer management. She currently has a large 6x7cmm ulcer on the outside and underside of her foot. An incision was made down the outside of her foot and the infected 5th metatarsal and all phalanges removed. A foot badly deformed by leprosy. The wound may be packed and left open to heal by granulation tissue growth from the bottom up if it is really infected, which also allows for continued irrigation, or it may be stitched closed if the wound is relatively clean. The patients handle all of this remarkably well. The ring block numbs any remaining pain receptors, after the majority have long been destroyed by the leprosy and past infection. If the patient does report pain post surgery they are given Voltaren. They are also given 7 days of post-op antibiotic coverage with oral cloxacillin. They certainly breed them as tough as boots here! But this truly is the reality of a poorly resourced hospital – you do what you can, where you are, with what you have and it seems the majority of patients pull through without too much trouble. I guess what is sad, is I know this is only the beginning. Although the current problem may be solved, the next will follow not too far behind as pressure is now moved to another anesthetic area of the foot, and without adequate foot protection another ulcer and infection will surely develop and so the vicious cycle of infection and amputation continues. This literally carries on until there is no more hand or foot to amputate and the patient is wheelchair bound or hobbles around on stumps and prosthetics. The beautiful surroundings of rural Pokhara. Management of these leprosy related complications is still largely reactive, rather than proactive. The whole situation develops out of this tangle of contributing factors – the disease process itself meaning damage can done with little distress to the patient, little to no education on foot or hand care, lack of resources, economic, social and cultural drivers which means all the patient is concerned about is returning home to continue working, earning an income or resuming their role within the family. My head spins trying to think about where you even start in trying to prevent the same and other patients ending up on the operating table. There is no easy answer that is for sure! The heavier sights and situations this week were well balanced out by the beauty of surrounding rural Pokhara as my B&B hosts and I went for a day mountain-bike ride to the edge of the Annapurna conservation area to visit a rainbow trout farm. 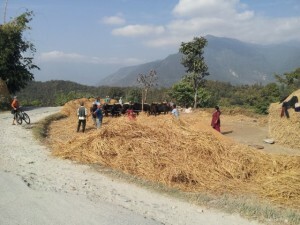 On our way, we stopped and attempted to talked with broken Nepalese to some locals busily harvesting the last of their rice. They thought it was hilarious I wanted to stop and take photos, though I managed to clear up that I wasn’t American, but from New Zealand which they thought was even better! 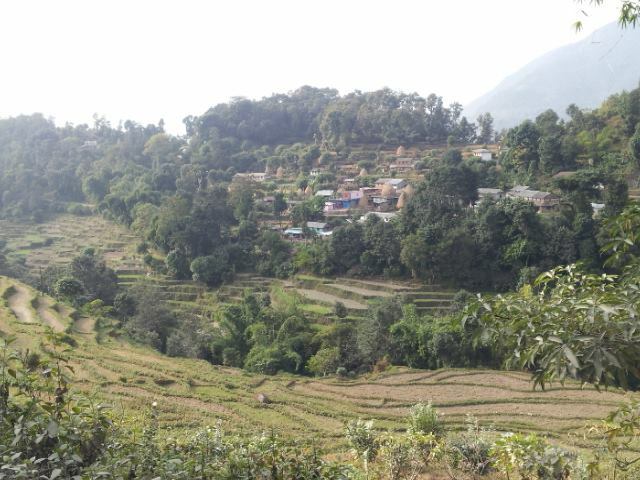 I can’t help but be totally mesmerized by the countryside here – its immaculately terraced rice paddies and the beautiful way of life of the rural people in Nepal. The trout was very delicious to! Locals busily harvesting the last of their rice crop. It was also the Mountain festival over two days this week, perfectly timed as we also had at least three gloriously clear days where the surrounding Annapurna Mountains were visible in all their beauty, which was fantastic given they have basically been hidden behind cloud since I arrived. So I decided to join the festivities and enter a mountain bike race around southern Pokhara, possibly against my better judgement given the current fitness levels. However, I turned up with my hosts at 6.30am sharp for a 7am start as written on the entry form. At 7.30am everyone started to roll in leisurely and after a hilarious kerffufle trying to assign race numbers and get us all lined up at the start line the race started just after 8.15am. I am quite a patient person which is lucky because I haven’t got a hold of this ‘Nepali time’ thing yet – the mandatory rule that everyone arrives no earlier than 30min late. We set off at a cracking pace on a slight downhill before starting a very long and steep 800m up-hill climb, but that was ok and probably worked in my favour given I quite enjoy climbing. As we passed through villages, the children on their way to school were all very excited by the bunch of riders passing through and would start running full tilt along the road holding out their hands for high-fives some yelling “go faster!”, others “go slower!”, I am not sure who was left more confused! 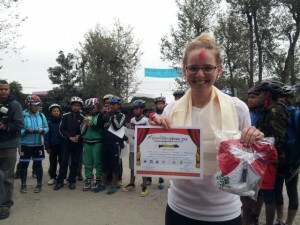 The winner of the mountain bike race reluctantly poses for photos. After meeting a bus on a corner and then nearly ending up with a face full of dirt after applying my brakes a little too vigorously, the down-hill I found a bit more frightening than amusing. The speed of some riders down these dirt roads, badly eroded by the monsoon’s and traffic combined, is at best terrifying! I was expecting to stop to do some patching up along the way, but fortunately I didn’t come across anyone in a tangled mess with their bike. There is speed, but also a huge amount of skill amongst those riders. I also survived and managed to cross the line first of the four women. The atmosphere was amazing as was the hospitality, they all clapped, yelled and tooted (naturally) as I arrived, then rushed me off to the food tent for hot tea, bananas and boiled eggs. With all the festivities, everyone was in a great mood and much to my horror fellow bikers, organisers and spectators wanted photos – I think seeing a woman biking, let alone in a race is still a novelty here, as sports are largely participated in by the male gender only. I could really only oblige – however on the pretense I could not be held responsible if their camera broke as a consequence. See you for next week’s learning experiences and adventures…Namaste!